Given the narrow port diameter, inflow of insufflation gas occurs at a low flow of approximately 1 L/min. This results in slow filling and evacuation of insufflation gas. Evacuation of smoke following the use of electrocautery is also slow, which may prolong the operative time. technology is also utilized in the manufacture of rigid minilaparoscopes. Further miniaturization of the minilaparoscopes has been facilitated by employing fiber-optic imaging technology. Each fiber-optic quartz fiber measures 6 pm in diameter. A needle-scope typically contains 30,000 to 50,000 quartz fibers arranged in a bundle. The fiberoptic tele-scopes are flexible. Because image transfer occurs via individual optical fibers, the image obtained appears pixilated. Overall, images obtained through rod lens systems are of improved quality compared to images obtained from fiber-optic systems.Also, the fiber-optic laparoscopes are delicate and damage to individual fibers impacts image quality. Further, unlike the rod lens minilaparoscopes, the fiber-optic minilaparoscopes cannot be autoclaved and need to be gas sterilized. Minilaparoscopes currently available include Storz microendoscopea, diameter 1 mm; Medical Dynamics microendoscopeb, diameter 1.8 mm; Pixie microendoscopec, diameter 1.9 mm; Minisited, diameter 2 mm; and Hopkins IIb, diameter 3.3 mm. Both reusable and disposable trocars for 3 mm minilaparoscopic instruments are available. Disposable trocars utilized for needlescopic surgery have an outer diameter of 2 mm (Miniportd), and are similar to Veress needles. The needle ports are valveless, although they have roughened outer surfaces, which minimizes leakage of gas. Given the narrow port diameter,inflow of insufflation gas occurs at a low flow of approximately 1 L/min. This results in slow filling and evacuation of insufflation gas. Evacuation of smoke following the use of electrocautery is also slow, which may prolong the operative time. Various reusable and disposable minilaparoscopic instruments are available for clinical use. Reusable instruments include scissors, hook scissors, single-action and double-action graspers, needle drivers, and suction-irrigation cannulas. Disposable insulated 2 mm shears (Minisited) designed for monopolar electrocautery are also available. The shears are equipped with only a thin layer of insulation, and the manufacturers recommend that electrosurgical power be limited to 30 W to prevent damage to the insulation and inadvertent thermal injury to adjacent tissues. 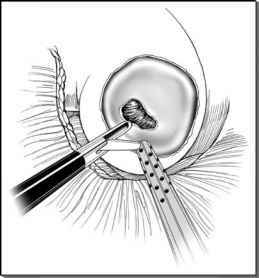 Instruments of larger diameter (3 mm) are sturdier than needlescopic instruments (2 mm). Also, wider selections of instruments are available in the former category, including needle drivers and a selection of tissue graspers.